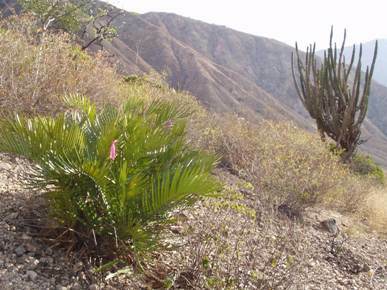 Zamia encephalartoides is a threatened cycad endemic to a unique ecosystem, the arid Chicamocha Canyon of Colombia. Its distribution and population status are poorly known, and expanding agriculture and other human activities are rapidly extirpating its known populations. We propose to use a combination of advanced technology and traditional survey techniques to produce high-quality information about its suitable habitat, distribution, and population viability so that an accurate Red List assessment and suitable Conservation Action Plan can be produced. We will employ remote-sensing technology to characterize potential habitat and evaluate the distribution, density, and reproduction of populations found.